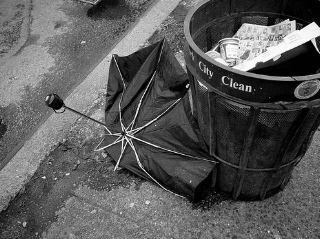 Ever have your umbrella blow inside out, only to cast it off into the nearest dumpster? Well, our good friends at ReadyMade magazine have a MacGyver challenge for repurposing a ruined umbrella. The best entry scores a subscription and a RM T-shirt. Hurry this contest ends November 30. No word on whether or not that tee is waterproof.